The next reveal from Four Horsemen is the robotic Gamma-X. 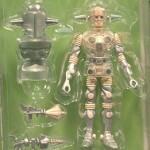 This addition to the Infinity Edition Outer Space Men showcases a 50’s styled robot. The figure includes a translucent body overlay and some retro firepower. As a figure using the Glyos system, these figures can be disassembled and their parts mixed and matched to create your own figures.